Wards Way of Teaching: I Heart U Day! First I just want to start by saying how much I love Valentines Day. I love the crafts, books, and of course exchanging Valentines and seeing how much fun my little students have. Last week my class and I created this bulletin for in front of our classroom. 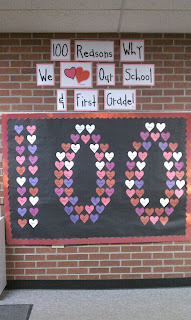 Since our 100th day is tomorrow I thought this was a great way to celebrate V-Day and 100th day all in one. This idea came from a Mailbox magazine. P.S. I have to give a shout out to my hubby for helping line up 100 hearts and gluing them on for me. Yes my students did come up with 100 different things they love about first grade! Way to go firsties! Here are the bags my students created. I got the idea from the blog The First Grade Parade thank you for sharing your idea! oh you were so meant to be a teacher! very cute. love it. I apologize that this comment is getting to you so late! I meant to follow up months ago and it must have slipped through the cracks. 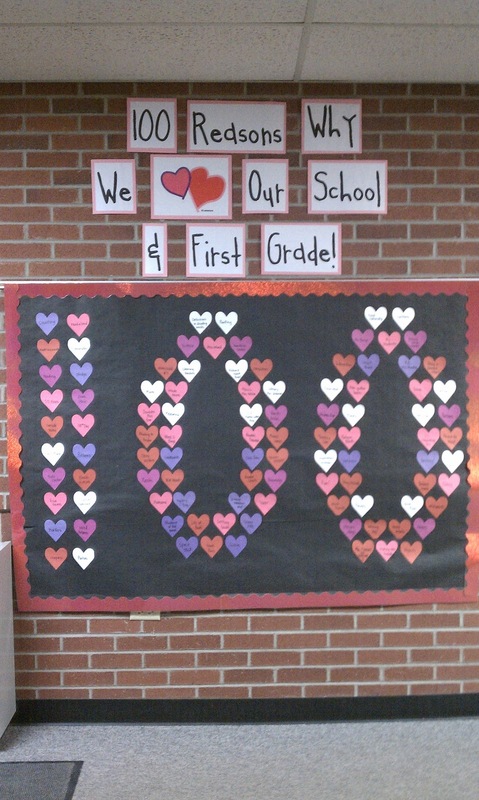 We wanted to let you know that we featured your awesome 100th Day/Valentine's Day bulletin board at our blog, Bulletin Board Ideas, as part of our 100th day round-up. As with all of our features, we were sure to give idea/photo credit, as well as a link back to your lovely blog, but we'd love for you to take a look at it. If there are any problems, we'll be certain to take the feature down immediately. Hope you're having a great school year!